July in the Antipodes is time for rose pruning. After a week of non-stop rain, I awoke to a blue sky with painted clouds and looking out the window realised that the new leaves on my roses were already starting to sprout. I seriously needed to get on with pruning the old dear. Auckland isn't really the place to grow roses - too humid in summer, so I only have one rose. It is no dainty standard type, but a gnarly old fashioned one 4m high that I would have pulled out long ago if it hadn't been so persistent. Its ugliness is only forgiven by its stubbornness to cease flowering well into winter accompanied by the scent of a 1000 perfumeries. Apparently it is difficult to breed roses for their scent, so another good reason not to remove this brute. 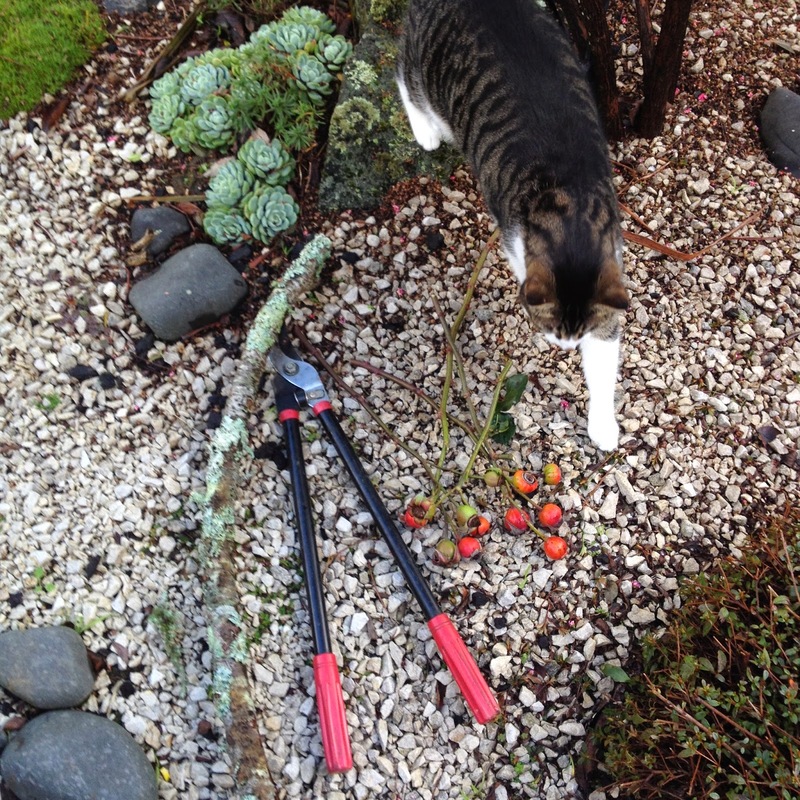 Accompanied by Frodo, my faithful gardening companion, and equipped with clippers, long handled clippers and a pruning saw, not to mention the thick gloves and protective clothing, I clambered my way behind the hedge and started pruning. I tried to avoid hacking the stems which was tricky because of the height of the plant and to avoid being stabbed by razor sharp thorns. The rose 'branches' were way above me (a ladder would have been helpful, but threw out our old one recently! ), so I had to stretch to reach the skyward growing stems and bend my body into weird angles to avoid having my kidneys punctured by surrounding bushes and branches. 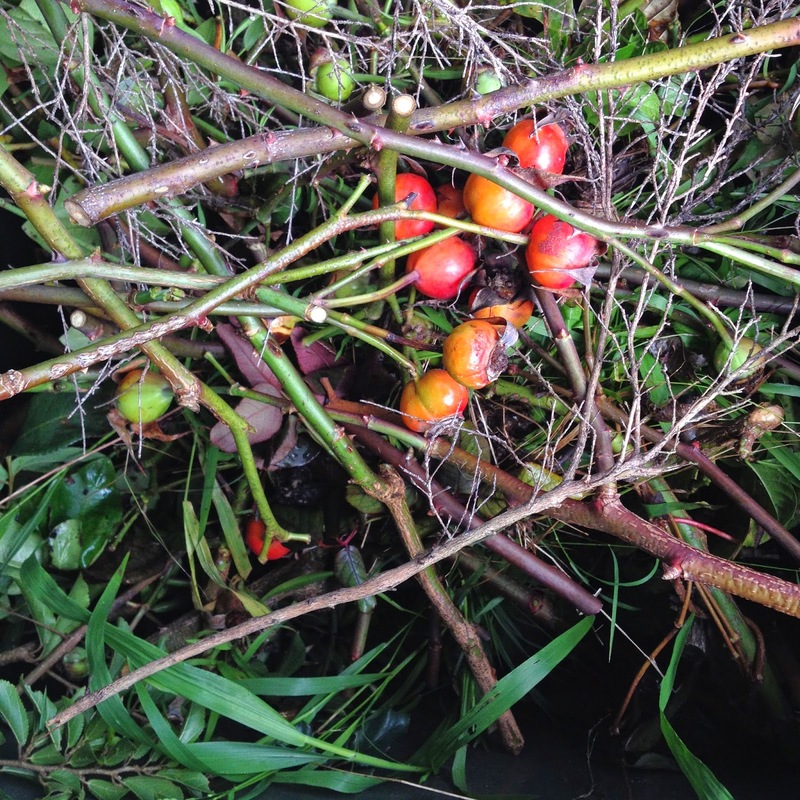 After three quarters of an hour, I had all the branches cut down into stick lengths and dumped in the garden bin. I can tell you that the cup of tea that followed was well earned! 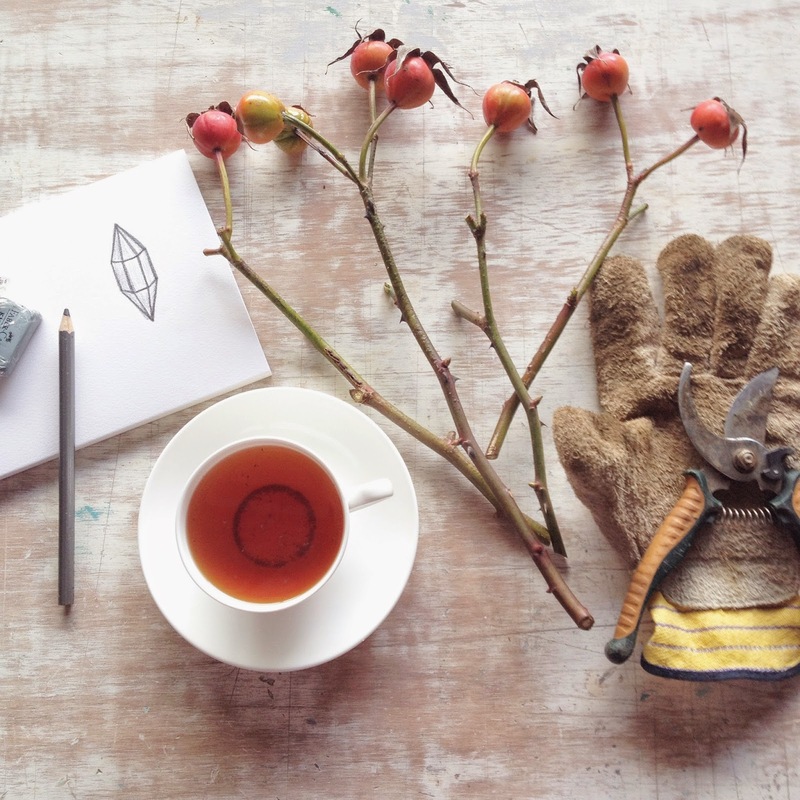 In a standard or bush type of rose, the purpose of pruning is to create a bowl to allow light and air into the centre and to encourage the plant's branches to fan outwards. My rose 'tree' is against a fence so I needed to prune it to ensure that the branches didn't grow across each other. 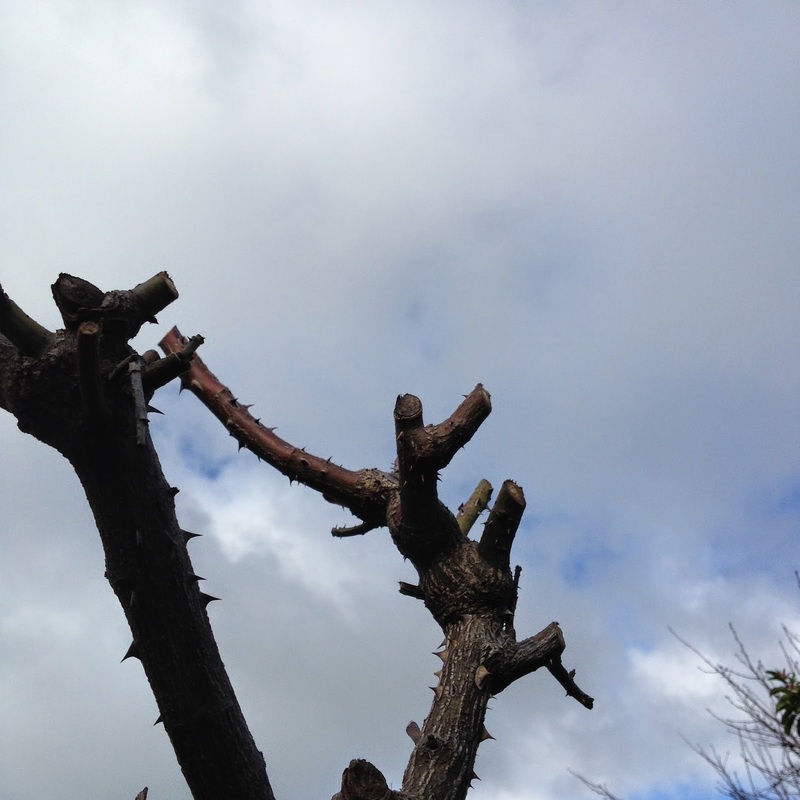 Also I had to be careful not to remove too many branches too far down to the woody stem. It is important to make a cut at an angle above a growth node. Also depending on which way you want the branch to fan out, you need to choose your cut above the correct node. The easy gardener for New Zealand gardeners. 1999. Random House Australia. Another fun #7vignettes completed! This Instagram challenge is run by Jen Francis who runs the blog Interiors Addict and who is currently flitting around Europe and America. 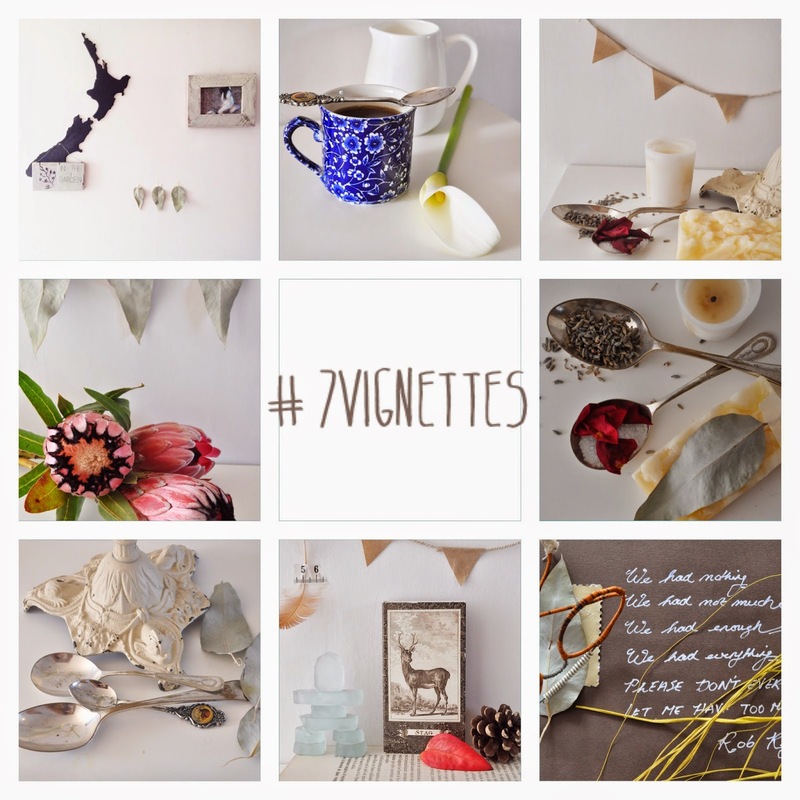 Despite this, she still found time to post and this month, judge, the #7vignettes challenge. Each day there is a theme and it's incredible to see how each participant interprets them. The winner was the wonderful Angela Steyn an interior designer from Australia. Angela puts together the most beautifully edited photographs. Somehow she knows just how many items to include in her compositions and in the most muted calming tones.